Top U.S. and Iranian negotiators met for at least three hours Wednesday in Vienna to try to iron out differences in a nuclear agreement, one day after world powers extended yet another deadline to reach a final deal. U.S. Energy Secretary Ernest Moniz met with Iranian nuclear chief Ali Akbar Salehi twice Wednesday for a total of nearly three hours, a senior U.S. administration official said. U.S. Under Secretary of State for Political Affairs Wendy Sherman, America's lead negotiator, also met with Iranian Deputy Foreign Minister Abbas Araghchi Wednesday. No details of their meeting were immediately released. 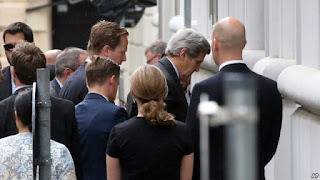 U.S. Secretary of State John Kerry and Iranian Foreign Minister Mohammad Javad Zarif are staying in Vienna, although it is unknown if they will meet. Kerry met Wednesday with members of the U.S. negotiating team. The foreign ministers of the five other nations at the negotiating table have left Vienna. French Foreign Minister Laurent Fabius was expected back later Wednesday along with German Foreign Minister Frank-Walter Steinmeier and British Foreign Secretary Philip Hammond. But Russian Foreign Minister Sergei Lavrov and Wang Yi of China have announced no immediate plans to return, suggesting negotiators were still not close to a deal. Negotiators have now given themselves until Friday to come up with a comprehensive accord. All seven ministers had arrived to Vienna over the past few days in hopes their added diplomatic weight would clinch agreement. A Western diplomat in the Austrian capital said late Tuesday the talks with Iran are not "open-ended" and have just been extended for the last time. The envoy from an unnamed country told reporters "it's difficult to see why and how we could go on any longer. Either this works in the next 48 hours or it doesn't." It is the fourth time the parties have extended the interim deal struck in November 2013 that gave Iran limited sanctions relief in return for its restricting its nuclear program, including halting production of 20 percent enriched uranium. Senior Iranian negotiator Araqhchi said "no deadline is sacrosanct," insisting Tehran would "continue talks as long as it is necessary." A spokeswoman for the U.S. delegation, Marie Harf, said Tuesday the United States is "frankly more concerned about the quality of the deal than we are about the clock." The agreement between Iran and the six powers – Britain, China, France, Germany, Russia and the United States – would cut Iran's uranium enrichment program to keep it from being able to build a nuclear weapon. Sanctions that have wrecked the Iranian economy would be eased and eventually lifted. But Iran is balking at Western demands for inspections of its military sites to verify it is living up to the deal. Iran also is now demanding the end to a U.N. embargo on conventional military weapons sales to Tehran. A senior Western diplomat said a Monday conversation over the arms embargo was "very heated." German Foreign Minister Frank-Walter Steinmeier said Iran needs to help build trust, and a monitoring program will be needed to ensure it complies with a nuclear agreement it is negotiating with six world powers. "Trust has been destroyed on the part of Iran. For this reason, Iran above all has to now offer input to help build up trust," Steinmeier said in advance extracts of an interview with German broadcaster ARD Tuesday. "This means that we have to have monitoring possibilities available to have an overview as to whether Iran is fulfilling its obligations. We need to be sure that we have transparency concerning the promises Iran is making here." The White House said Tuesday it knows that "significant differences" remain. But Kerry said this week that all sides have never been closer toward reaching a final deal and that the talks are, for now, worth continuing. If a deal is reached by Thursday, the U.S. Congress would have 30 days to review it and vote on whether to lift certain sanctions that lawmakers have imposed. After Thursday, the review period becomes 60 days.